The inaugural Automotive Aftermarket International Trade Fair, AAITF Bangkok 2015, will take place 9-11 December 2015 at the world class IMPACT Forum Exhibition Centre, Bangkok. The three day B2B event, free to attend for trade visitors, is organized by Tarsus Group Ltd, an International Media company, and co-located and partnered with the organizers of the Thailand International Motor Expo which annually attracts over 1.38 million visitors. Thailand is the largest production base in the ASEAN and the nerve centre of the supply chain for the automotive aftermarket. AAITF Bangkok 2015 will provide a much-needed B2B platform for buyers from one of the world's fastest growing aftermarkets to source new products which can enhance their business. Peter Massey, Event Director stated; "Thanks to its location within SE Asia's trading and transport hub, AAITF Bangkok offers unrivalled opportunity to make new commercial contacts across some of the world's fastest developing Automotive Aftermarkets. The inaugural event will feature over 200 international and local brands, showcasing new and innovative products at the forefront of the industry. Global thought leaders such as Meguiars, Little Trees, RUPES S.p.A, Sussex Autoparts and Bosch have already shown their support in anticipation of making new commercial connections with 5,000+ buyers from Thailand and across SE Asia. Meanwhile, visitor pre-registrations are strong thanks to innovative hosted buyers and content programs featuring novel trends such as electronic retailing for the aftermarket and 3D Printing, as well as an event partnership with Thailand's leading consumer motor show, The Thailand International Motor Expo." Covering the full range of the aftermarket, the exhibition will be host to thousands of the most innovative products including; auto films, car care and beauty products, auto modification products, auto multimedia products, auto lights, auto tuning, auto accessories, auto audio, auto electronics, connected car products, auto parts, coating and auto repair products. Demonstrating the international reach of the show, exhibiting countries include Germany, Thailand, United Kingdom, Hong Kong, Italy, Malaysia, Australia, India, China, Taiwan and the USA. AAITF Bangkok 2015 has caught to attention of key brands who will be bringing their most innovative products to the show include Meguiars, Sussex Autoparts RUPES S.p.A, Mchanix, Connects2, Modern Technic Lock Co., Ltd, Autocar India, Patanayont Import-Export Co., Ltd., Liang Fei Industry Co., Ltd, T.R.R. Auto Part Co. Ltd, Oxford Business Group, Setech Co., Ltd (Formula Group), Picolink, Kunming Songcheng Automobile Repairing Equipment Co., Ltd and Aupart Suspension to name a few. Pre-registration for the show is on track for an expected minimum of 5,000 B2B SE Asian and International Buyers. There is international interest of the show with buyers having pre-registered from; Africa, USA, Australia, Bangladesh, Brunei, Canada, Cambodia, China, Ghana, India, Indonesia, Iraq, Japan, Korea, Lao, Myanmar, Malaysia, Pakistan, Poland, Singapore, Sri Lanka, Taiwan, Thailand, Vietnam and the United Kingdom. The core buyer profile will consist of aftermarket retailers, aftermarket distributors and agents, Independent modification shops / garages, Car dealerships and service centres and OEM manufacturers. AAITF Bangkok will host an exclusive pan-Asian, high level content, 1-day conference program for senior level members of staff on December 9, 2015. The AAITF Executive Forum is billed as a meeting place for the aftermarket leaders in the ASEAN. The conference will consist of 8 sessions for key individuals from the leading retailers, buyers, distributors and agents in the region and will be covering trends, issues and challenges, products and innovations in the automotive aftermarket in Thailand and Asia Pacific. A leading company at each level of the supply chain will make a presentation on a specific topic. The day will end with a panel session composed of the AAITF Executive Advisory Board, whereby key topics will be discussed as well as there being a chance for a Q&A session from the audience. As such, the AAITF Executive Forum will act not only as an information source, but a veritable marketplace for these key industry players to network and do business. B2B visitors at AAITF Bangkok 2015 will have exclusive free access to a two-day innovative technical workshop and seminar program on December 10 and 11. The program is set to cover the most up to date topics in the SE Asian automotive aftermarket. Uli Kaiser, Thai Autobook and TEBA president, will present the Keynote Session on 10 December, 2015, looking at 'Aftermarket Ecommerce: Global Opportunities'. Ben Bartlett, director of Mercury PM and former senior manager of the Australian Automotive Aftermarket Association (AAAA) will cover 'Access to technical and diagnostic information for the average trade workshop' and 'The impact LPG/CNG has on engines and what the trade should be aware of and how to rectify the issues'. In addition, Jason Rose, global training manager at RUPES S.p.A will present a live product training class on 'Random Orbital Polishing Techniques'. Meguiars and Sussex Autoparts will also be host to live product demonstrations and training workshops onsite. In order to bring together the most influential individuals and key industry players in the automotive aftermarket, AAITF Bangkok have developed the AAITF VIP Executive Club. The exclusive networking group is for high level trade buyers and industry professionals with the greatest influence and purchasing power in the industry. Pre-registered individuals can apply to be in the group, others will be chosen carefully by the organizers. Members of the group will receive a variety of benefits, including access to the Executive Forum, a VIP goody bag, access to the VIP networking area, a free industry report worth $280 from the Oxford Business Group and much more. AAITF Bangkok 2015 has received support from associations such as TEBA (Thai European Business Association), TCEB (Thailand Convention & Exhibition Bureau), Oxford Business Group, Thai Auto Parts Aftermarket Association (TAPAA), Thai Exhibition Association (TEA), The Union Motors Repairing Association of Thailand, Thailand Automotive Institute and The CVTA (Connected Vehicle Trade Association). Through the support of TCEB, the organizers of AAITF Bangkok are able to offer all visiting associations $100 per delegate who have three business meetings through the 'Connected Business Campaign' and the president of each association 2 nights hotel stay through the 'Be My Guest' campaign. There is more information on the visit section of the website and how to apply. Not only has the show received huge support from local and international associations, AAITF Bangkok has over 25 confirmed local and international media partners with a combined readership of over 2 million. Media partners include the likes of Autocar India, Autocar Professional, Motor Trader Malaysia, Counterman Mag (Babcox), Overdrive India and 9tro Alliance allowing the show to reach a truly global targeted audience. Intermedia consultants, co-organizers of AAITF Bangkok 2015 and organizers of the Thailand International Motor Expo, have a three further publications including Car Stereo, 4Wheels and Formula Magazine which hold a combined readership of 950,000. AAITF Bangkok has established an Executive Advisory Board to ensure that AAITF Bangkok provides all the latest information on the Automotive Aftermarket. Members of the advisory board have expertise in specialized areas of the auto aftermarket. Uli Kaiser, President of Thai European Business Association (TEBA) specialised in the ASEAN Automotive Industry; Jaymes Khell, Proprietor of Asia Business Consultation, specializes in Automotive Collision Repairs & Refinish; Scott McCormick, President of the Connected Vehicle Trade Association, specializes in the Connected Vehicle; Ben Bartlett, director of Mercury PM and former senior manager of the Australian Automotive Aftermarket Association (AAAA) specializes in the Australian Aftermarket and Jeff Smit TaT, Director and Head Trainer specializes in Technical Training. Product launches onsite at the show will include DriveBot, said to be 'the definitive innovation in car care made in Thailand'. "Drivebot is a small electrical device that makes car inspection as easy as finger touch. It can analyze the condition of a car through the OBD II port linking with the car's ECU and displaying results and advice via the mobile app," explain the makers. In cooperation with The Union Motors Repairing Association of Thailand, AAITF Bangkok 2015 will also feature two cars with modified body and paintwork by Siam Auto Body. 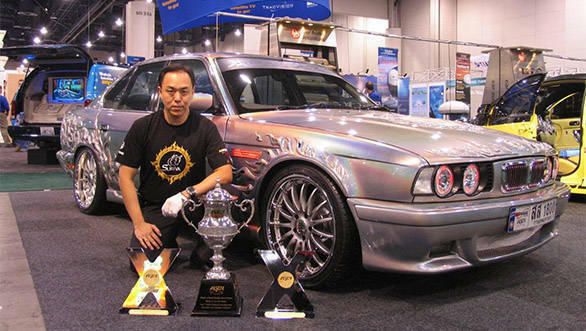 "Suriyan" is a BMW that has been transformed into a silver color with a pigmented effect that changes its shade according to the light angle of incidence. The modifications also include unique 3D flames imprinted on various parts of the body. The car won the first prize in an international car contest. The second car from Siam Auto Body is a Jaguar XKR converted from a classic sports car into a modern Jaguar by incorporating the front and rear body parts from the new model. Siam Auto Body state, "These are not just examples of car paint and body repair jobs, but a restyling of the whole car, requiring advanced technology and technicians with pertinent skills and experience."